The assistant shopkeepers Paul-Émile and Aimé Rivard, seated in the delivery wagon of their father Eusèbe’s general store, circa 1920. At shoemaker Eusèbe Rivard’s shop, local families and visitors could buy not only shoes, but also everyday products and food staples. Dry goods like flour and sugar in 100-pound sacs arrived regularly at the Cacouna wharf by schooner and were delivered to the warehouse behind the store. Local residents and summer visitors were among Rivard’s many customers. 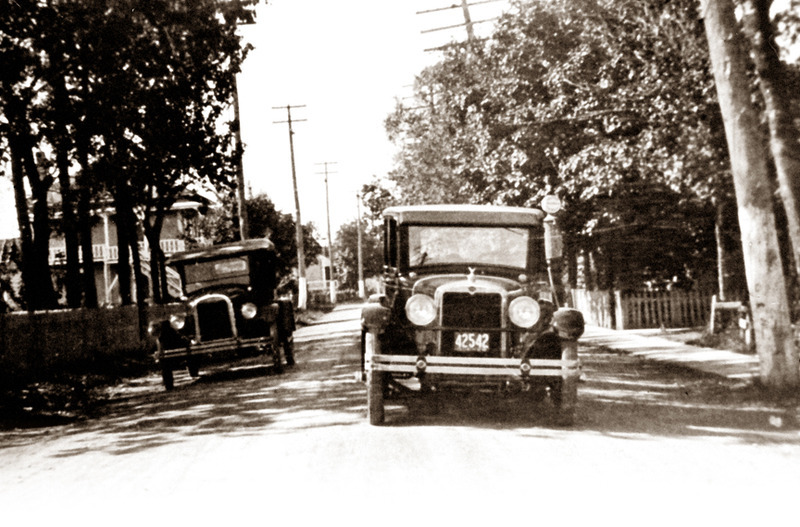 Around 1925, motorists would stop at the fuel pump of Eusèbe Rivard’s general store, on the right. In the early 20th century, when automobiles first appeared on the country roads, Monsieur Rivard began offering gasoline to travellers, especially the tourists. The youngest member of the family, Paul-Émile, would tend the pump until late in the night. During Prohibition in the 1930s, smugglers on late-night liquor runs would sometimes stop at the gas station. Rivard did not want to be involved in smuggling, with all its risks, legal and otherwise, so he gave up selling gas altogether. Over the years, Eusèbe Rivard also stopped selling household products and staples to focus on making shoes and repairing clocks. This work kept him very busy, especially when it came time to restitch all the shoes for the nuns of the Sœurs de la Charité convent, with the help of Alfred Larouche. 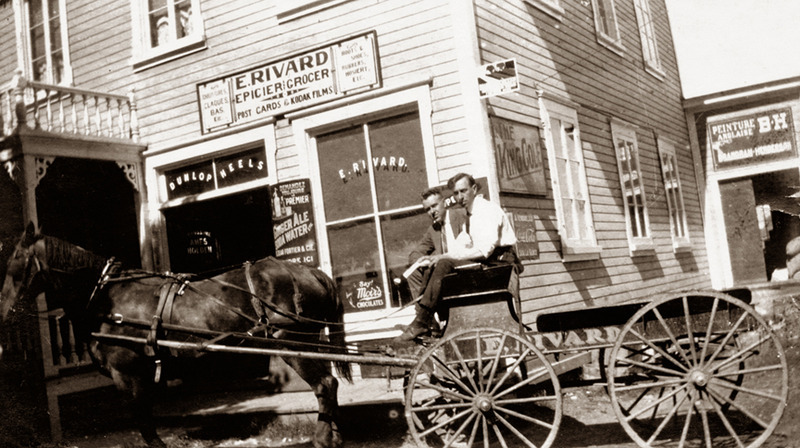 Monsieur Rivard also helped his two sons, Aimé and Paul-Émile, open businesses close to the family home. 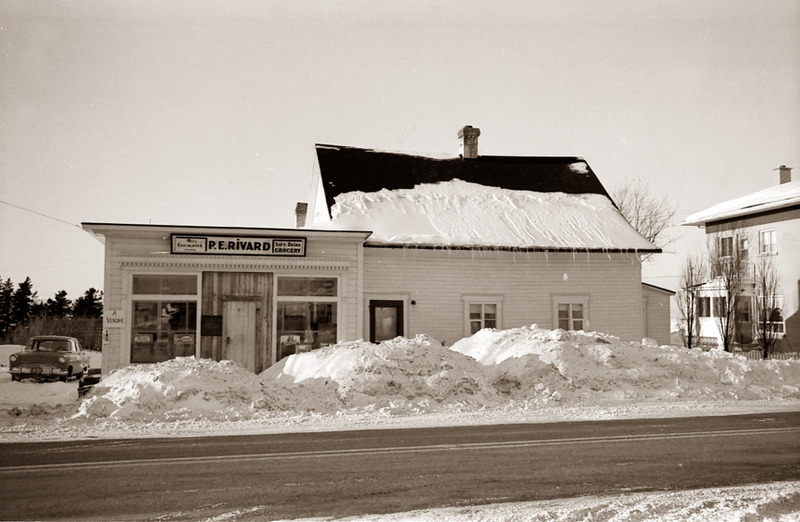 Paul-Émile Rivard’s general store façade, around 1970. In 1925, Paul-Émile bought the house next door from a certain Madame Lavoie. He had an extension with two showcase windows built to accommodate his store. 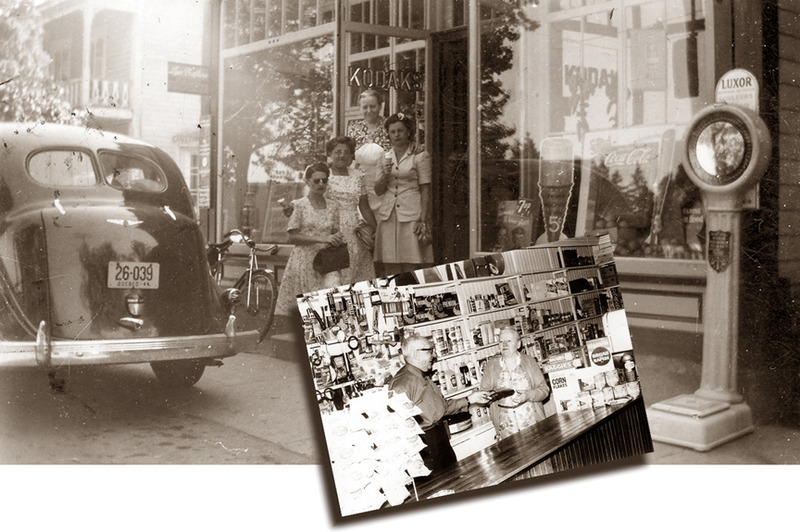 From 1925 to 1970, he and his wife Marie-Blanche-Rose Castonguay provided their customers with pharmacy and hardware products, as well as offering popular sweets for the area’s children. 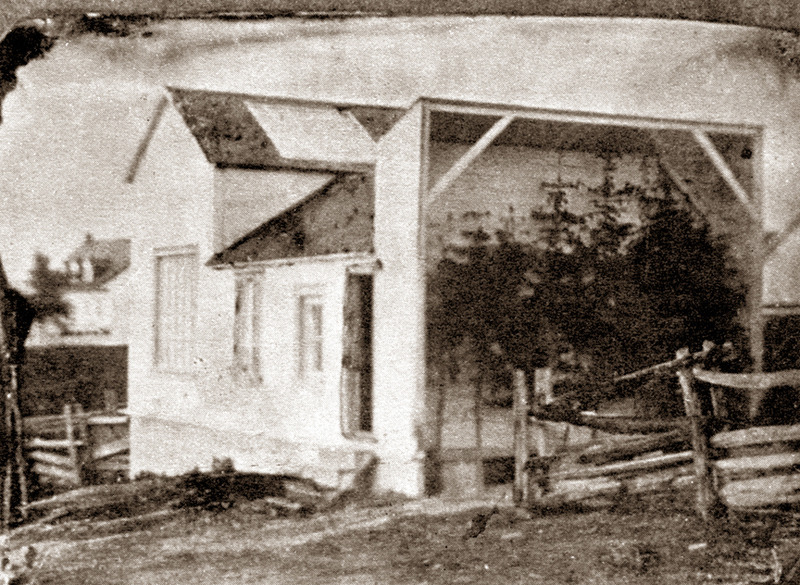 Aimé Rivard’s store annexed to the house, around 1930. In 1928, Eusèbe Rivard’s oldest son, Aimé, bought the field on the other side of the Rue Principale from Georges Dionne, a farmer. He hired workers to build his house, later adding a glass-fronted shop against one wall. Young Marc, son of Aimé, seated on a load of sacks ready for delivery, around 1935. Starting in 1930, he began making home deliveries to build up his customer base. He rented a horse from his neighbour, Léo Vaillancourt, hitched up his delivery cart and drove out to the second concession road. 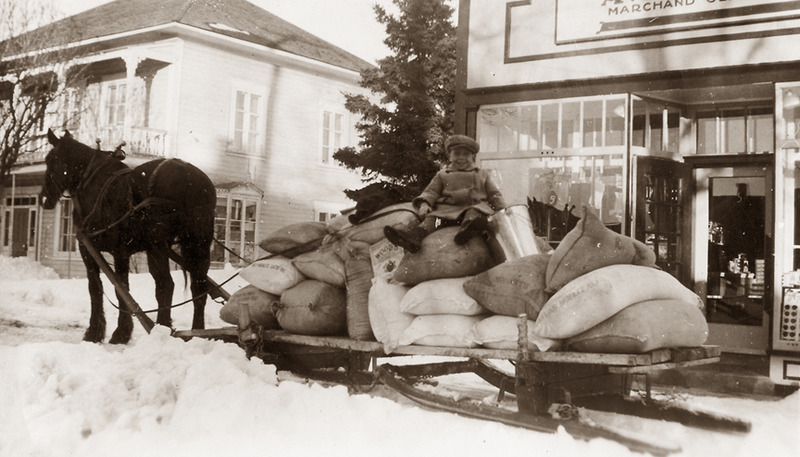 On each trip, he piled his cart high with large sacks of Lac des Bois bread flour, 100-pound bags of sugar, 85-gallon casks of maple syrup or vinegar, and 140-pound bags of salt for the fishermen. On his door-to-door rounds, he also provided farmers with animal feed such as bags of oats, bran, “brown shorts” and wheat middlings. 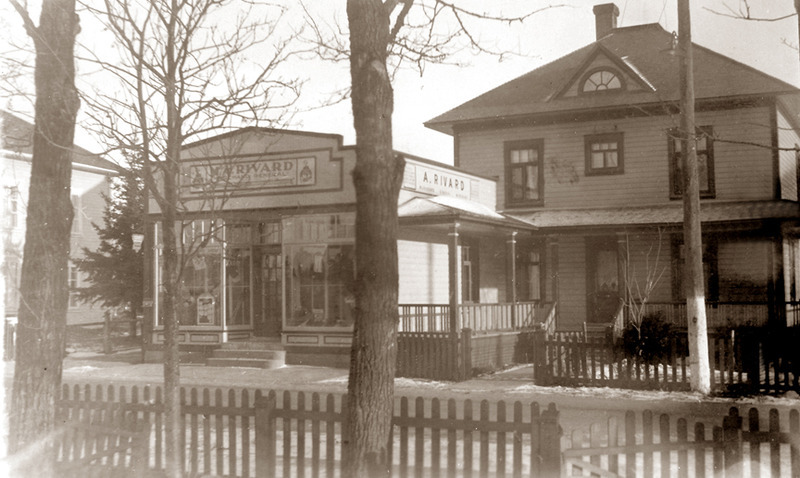 The general store of Aimé Rivard, around 1940 and around 1970. Through the years, right up to 1970, Aimé Rivard displayed a multitude of products in his shop windows, giving the impression that he had just about everything anyone could need in stock on his shelves and in his warehouse. 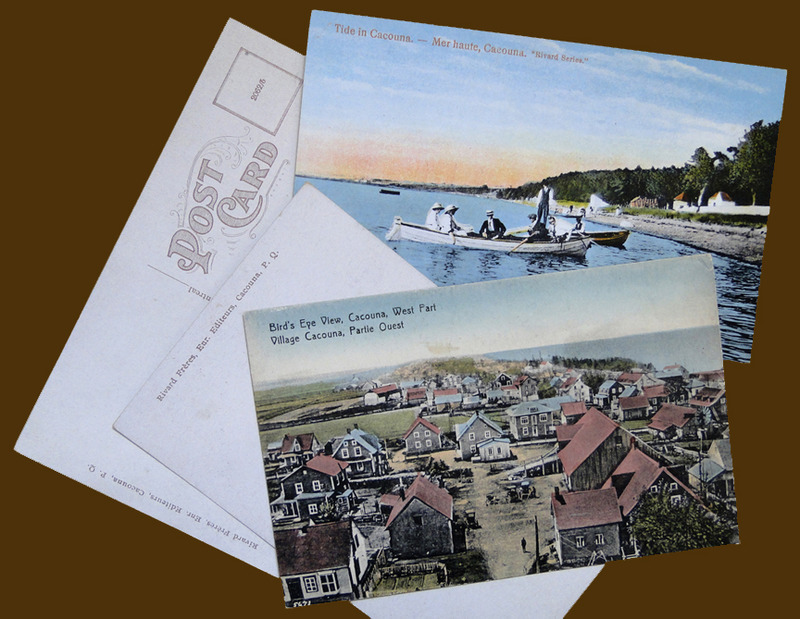 For many years, summer visitors to Cacouna could share their holiday experience with friends and family by choosing Rivard Series postcards from the display at the lunch counter. 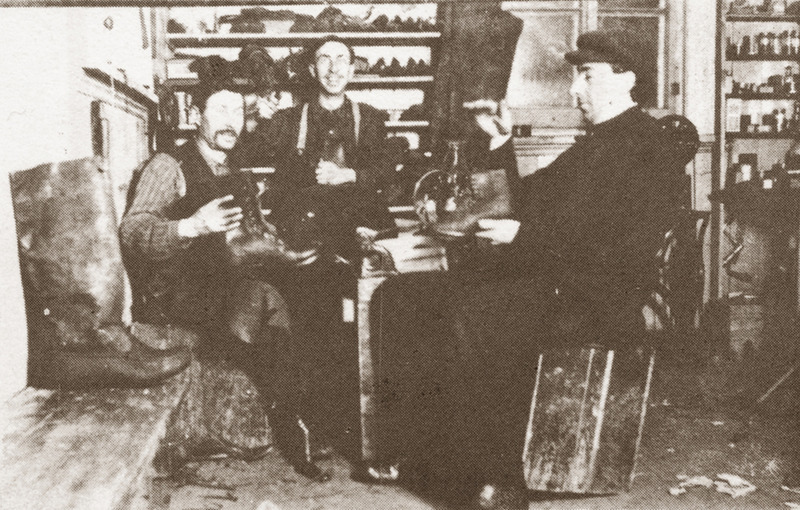 Aimé Rivard created the collection in the 1910s, when he was a clerk in his father Eusèbe’s store. He continued producing the postcards and, in the mid-1920s, teamed up with his brother Paul-Émile as Rivard Frères Enr. People throughout the province and beyond discovered the beautiful village of Cacouna from these postcards featuring photographs of the area. To offer images in colour, Aimé Rivard sent some of his photos to Germany for printing. As both photographer and publisher, he continued to offer the Rivard Series and A. Rivard postcards until the 1940s. Artist and photographer Ernest Mercier had a studio near his family home to the west of Paul-Émile Rivard’s store. Young Louis-Philippe Mercier holding one of his father’s cameras, with his neighbour Paul-Émile Rivard, around 1910. When taking photo portraits inside the studio, he used a landscape painting as a backdrop, and when working outside, he used a natural setting improvised from a few conifer trees and a park bench. His customers would receive two photographs for a mere twenty-five cents. Using photographic glass plates, Mercier also captured images of the pastoral landscapes of the surrounding countryside and the St. Lawrence River. People swimming, sailing, or building the wharf were all subjects that inspired the artist. His photographs were published on postcards by J.P. Garneau of Quebec City and the Illustrated Postcard Co of Montréal. 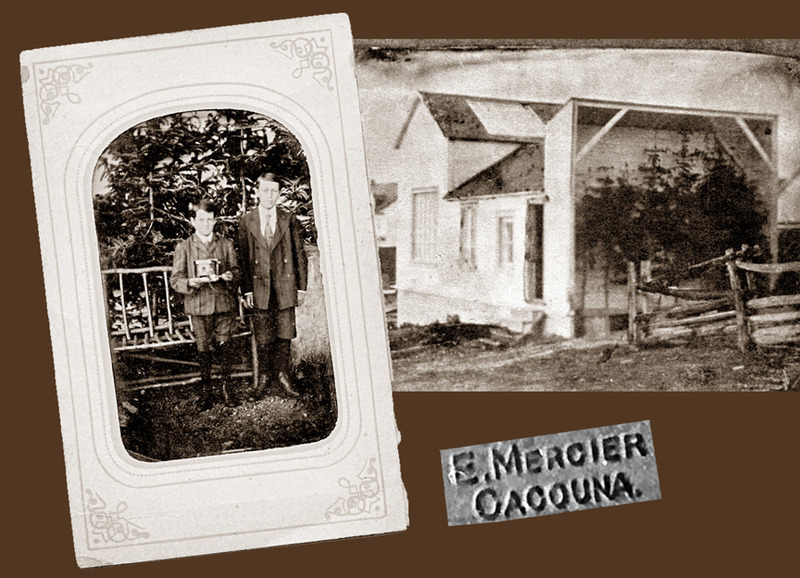 Mercier, whose father Herménégilde Mercier was a farmer in Cacouna, stopped coming to the family home for the summer season around 1911, after his wife died. He was a pioneering photographer, paving the way for others, including Aimé Rivard.